This entry was posted in Beautyberry on June 3, 2015 by John S. Quarterman. Picture by John S. Quarterman for Okra Paradise Farms, Lowndes County, Georgia, 16 May 2013. This entry was posted in Beautyberry, Okra Paradise Farms and tagged 16 May 2013, Brown Dog, Callicarpa americana, Georgia, Gretchen Quarterman, John S. Quarterman, Juniperus virginiana, Lowndes County, Okra Paradise Farms, Yellow Dog on May 23, 2013 by John S. Quarterman. This entry was posted in Beautyberry, Okra Paradise Farms, Plants and tagged 30 September 2012, Brown Dog, Georgia, Gretchen Quarterman, John S. Quarterman, Lowndes County, Yellow Dog on October 1, 2012 by John S. Quarterman. This entry was posted in Agriculture, Beautyberry, Okra Paradise Farms and tagged 18 August 2012, Agriculture, Beautyberry, Brown Dog, Callicarpa americana, corn, Georgia, Gretchen Quarterman, John S. Quarterman, Lowndes County, maize, Okra Paradise Farms, Terry Davis, Yellow Dog, Zea mays on September 8, 2012 by John S. Quarterman. In 2006, researchers at the U.S. Department of Agriculture’s Natural Products Utilization Research Unit in Oxford, Miss., found that extracts from beautyberry leaves could match DEET for repelling mosquitoes. 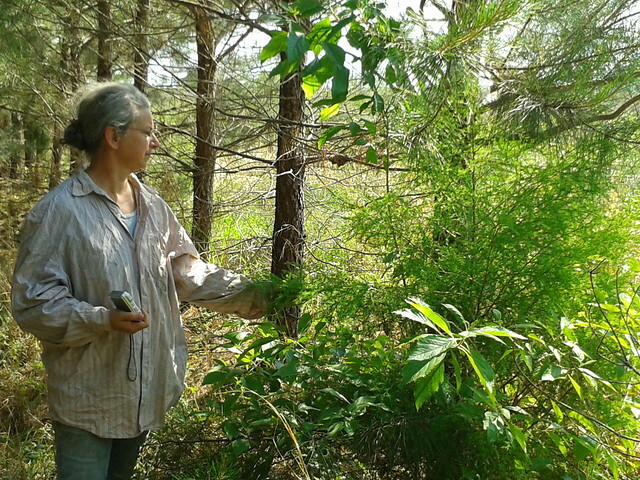 The next year, experiments showed that the active ingredients from the leaves (callicarpenal and intermedeol) provided 100-percent repellency of black-legged ticks for three hours. 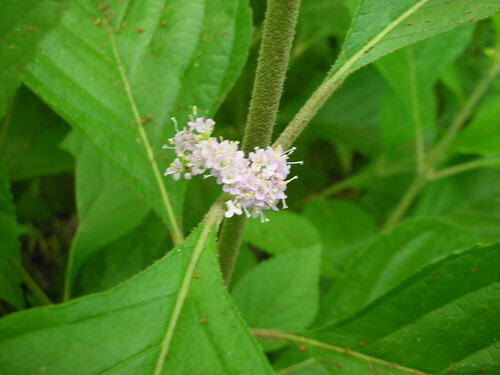 In 2008, the four-person research team, headed by chemist Charles Cantrell in Mississippi and entomologist Jerome Klun in Maryland, published research that added fire ants to the list of pests repelled by essential oil distilled from beautyberry leaves…. 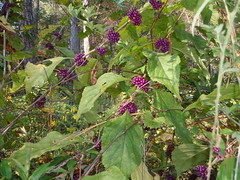 This entry was posted in Beautyberry, Insects, Okra Paradise Farms, Silviculture and tagged Beautyberry, Brown Dog, Callicarpa americana, Charles L. Cantrell, Georgia, Gretchen Quarterman, insect repellant, Insects, John S. Quarterman, Lowndes County, Okra Paradise Farms, Silviculture, Yellow Dog on July 23, 2012 by John S. Quarterman. This entry was posted in Agriculture, Beautyberry, Food, Okra Paradise Farms and tagged 4 June 2008, 5 July 2010, Beautyberry, berries, Callicarpa americana, flowers, Georgia, Gretchen Quarterman, jelly, John S. Quarterman, Lowndes County, odor, Okra Paradise Farms, smell, taste on December 14, 2011 by John S. Quarterman. Further, William Bartram did mention it in his Travels of 1791, as French mulberry. Curiously, even though Google books does have Bartram’s book, ngrams doesn’t seem to show French mulberry for that date, but does show American mulberry. Even more curious, William Bartram’s father, John Bartram, corresponded with Linnaeus, the founder of modern botanical terminology. This entry was posted in Beautyberry, Books, Botany, Food and Drink, Health, History, Plants, Silviculture and tagged 1791, Beautyberry, Botany, Callicarpa americana, dwarf mulberry, Florida, French mulberry, Georgia, Google, John Bartram, Linnaeus, Lowndes County, mosquitoes, Moultrie, ngrams, sour berry, sow berry, Spanish mulberry, Travels, Wayne Bell, William Bartram on December 28, 2010 by John S. Quarterman. Google’s latest new thing is which show frequency ngrams, of any given word (or more than one) in books from 1600 to the present. Beware, you can end up there for hours! 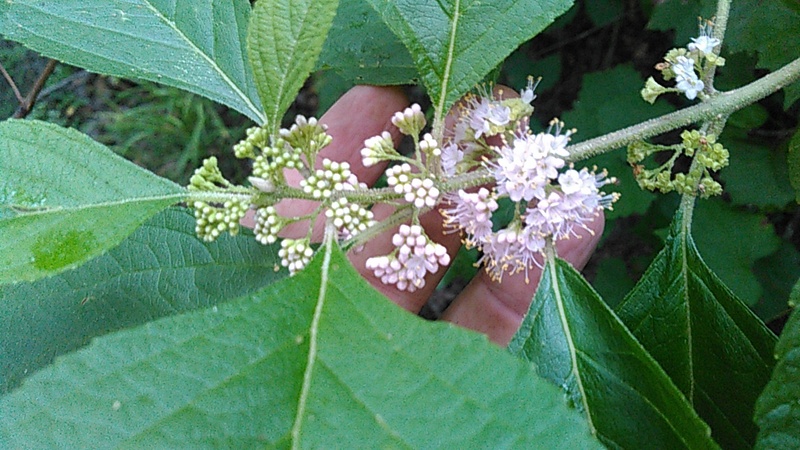 Anyway, comparing the common name beautyberry to the scientific name Callicarpa americana, it seems that the “common” name is much newer, at least in books. This entry was posted in Beautyberry, Plants and tagged Beautyberry, Callicarpa americana, Google, ngrams on December 22, 2010 by John S. Quarterman. This entry was posted in Agriculture, Beautyberry, Food, Gardening, Silviculture and tagged 17 Oct 2010, Beautyberry, Callicarpa americana, Georgia, Gretchen Quarterman, Lowndes County, preserving on November 28, 2010 by John S. Quarterman. So far we’ve picked and cook the beautyberries. 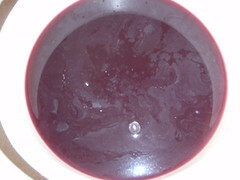 Now we want to pour it through a strainer to get out any remaining stems or skins. 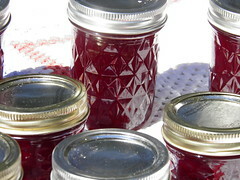 That’s why it’s going to be jelly, not jam. 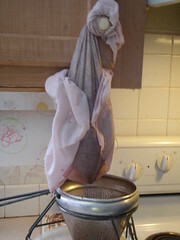 This strainer is an old pillow case. This entry was posted in Agriculture, Beautyberry, Food, Gardening, Silviculture and tagged 16 Oct 2010, Beautyberry, Callicarpa americana, cooking, Georgia, Gretchen Quarterman, Lowndes County, Straining on November 27, 2010 by John S. Quarterman.